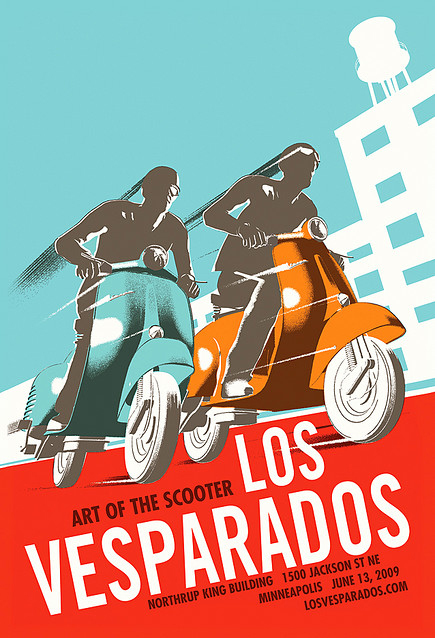 This letterpress printed scooter pop-up was used to promote “Los Vesparados” â€“ a scooter themed art show in Minneapolis circa 2009. By folding it together, you could have your very own paper scooter to ride around on your desk. Must have cost a fortune to do but oh was it worth it. This entry was posted in Art, Club Affiliated, Stationery and tagged angel bomb design, art show, business card, die cut, los vesparados, minneapolis, poster, scooter, sean tubridy, Todd Thyberg, vespa by Tracy. Bookmark the permalink. Thanks for posting this. Posters are still available and I’d be happy to include a little foldable scooter with any orders as well.